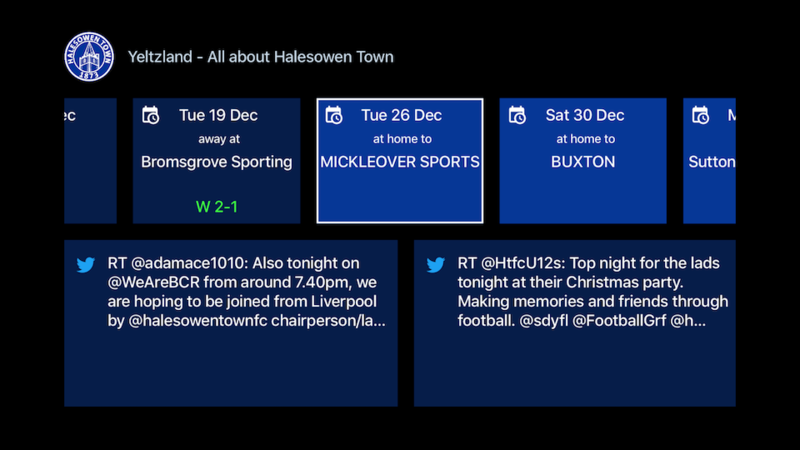 My quest to get my Yeltzland (Halesowen Town FC) app on every platform continues apace, and I’ve just released a version for Apple TV. It was my first time developing for tvOS, so it was fun project despite being of interest to a very limited audience. tvOS and iOS share a lot the same frameworks under the covers, so it was quite easy to reuse existing code to fetch the data. However designing a nice UI for the TV was more of a problem (for me! ), and it took quite a few iterations to get to an interface I’m happy with. It’s really easy to develop the app in Xcode using exactly the same techniques as for iOS apps, so it was really easy to get up and running. What is really good is wireless debugging directly on your Apple TV. I can’t imagine how painful on-device testing would have been if I had to connect my laptop via a wire. I’m really pleased with the results, and as you can see from the screenshot above it actually looks pretty decent! You can check out the app using the App Store link below - although to be honest I don’t really know how you link directly to an Apple TV app. I think if you have the iOS app installed it might show up directly on your Apple TV. Alternatively search for “Yeltzland” in the App Store directly on the Apple TV. The Yeltzland code is all open source, and can be viewed on GitHub.